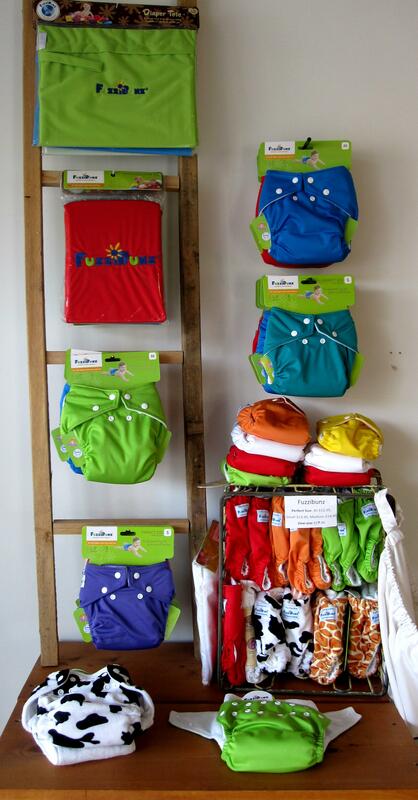 Since we opened our business 4 years ago we have been selling Fuzzibunz diapers. The Perfect Size Fuzzibunz were one of the first diapers that I fell in love with when diapering our first child (almost 7 years ago!!!). It was one of the only diapers that my son, who was sleeping 12+ hours at night, could wake up dry in. We were instantly in love with the fit, comfy feel and no leaks! We still recommend the Perfect Size diapers to anyone! Our first daughter in the Perfect Size Fuzzibunz. Fuzzbunz came out with their one-size version around the time we opened our store. We had several to test out at the time and found them to be small (not even as big as the Medium size perfect size) and the fit seemed too small when our daughter was only 22 lbs. For us they didn’t fit till potty training and we couldn’t stuff them with extra absorbency due to the small size between the legs. That meant that they always leaked at night. We weren’t very impressed. Last week I finally gave the new 2013 Elites a try. I was hesitant, first because I have so many diapers already, and second, because I wasn’t a big fan of the previous version of the Elites. Well, I have to say, I was absolutely impressed! Love the new fleece. The new fleece did not pill up while washing and was extremely comfortable and soft (one of the reasons I fell in love with the Perfect Size Fuzzibunz years ago) and left no red marks around the legs. I also love the new placement of the button holes for sizing the leg elastic. They are now easier to adjust and there’s no confusion as to were the extra elastic ends should go as it is already instead under the fleece. Old style in Pink New in Green. The next big change is the size. They are much bigger which makes them easy to stuff and add absorbency. I used them at night and had no problems with leaks and the fit was wonderful, much like my perfect size Fuzzibunz. Now, as we await the birth of baby #4, I think I will be adding more of these to my diaper stash as we will have two kids in diapers for a while and I know they will fit both! Great fit, soft comfortable fleece, easier to stuff, better sizing, no leaks, who could ask for more. If you are in the market for a one-size pocket diaper, we recommend you consider giving the NEW Fuzzibunz Elites a try! Today starts Fuzzibunz Elites Buy 5 Get 1 FREE sale, so now is the time to try this great new diaper. The Fuzzibunz Sale will last till our supply is gone as Fuzzibunz will also be sold out for the sale so we cannot order more. That means first come first serve. Click HERE to order online or stop in to pick yours up. We hope many of you can take advantage of this sale and email us if you have any questions! Enjoy the sale!